While New York City’s bustling art scene used to take a summer vacation, most galleries are now open throughout the season. But with so many museums and galleries, it can be difficult to know which ones are worth checking out. Robert Mann Gallery: The Robert Mann Gallery is one of the most renowned photography galleries in the world, featuring current photographers alongside twentieth century masters. From July 7-August 19, the gallery will celebrate summer with an exhibition called Back at the Water’s Edge. The group show features work from: Julie Blackmon, Jeff Brouws, Harry Callahan, Joe Deal, Richard Finkelstein, Elijah Gowin, Cig Harvey, Michael Kenna, Michel Szulc-Krzyzanowski, John Mack, and Henry Wessel. The gallery is located at 525 W 26th St, New York, NY. Aperture Gallery: Founded by celebrated photographers Dorothy Lange and Ansel Adams in 1952, the Aperture Gallery features both contemporary and classic photography. From July 14-August 11, the gallery will exhibit photographs selected through its annual “Summer Open.” The theme of this year’s open-submission exhibition is “photography is magic.”. The gallery is located at 547 W 27th St 4th Floor, New York, NY. Howard Greenberg Gallery: The Howard Greenberg Gallery features a diverse collection, reflecting genres and styles from Pictorialism to Modernism, as well as contemporary photography. Founded in 1981, the gallery was the first to consistently exhibit photojournalism and ‘street’ photography. The gallery regularly features the work of artists such as Berenice Abbott, Henri Cartier-Bresson, Andre Kertesz, William Klein, Gordon Parks, Edward Steichen, Paul Strand, Josef Sudek, and Edward Weston. It is located at 41 E 57th St Suite 1406, New York, NY. International Center of Photography: The International Center of Photography (ICP) is the world’s leading institution dedicated to photography. Its museum, which explores the legacy and the future of image-making, recently relocated to the Bowery. Its inaugural exhibition is Public, Private, Secret, which explores privacy in visual culture. The gallery is located at 250 Bowery, New York, NY. Steven Kasher Gallery: The Steven Kasher Gallery specializes in fine art photography, contemporary, and vintage. Prominent artists that are represented include Willem de Kooning and John Chamberlain. Until July 30th, visitors can view Andre de Dienes: Marilyn and California Girls. The exhibition, which is de Diene’s first solo show in NYC in 10 years, features more than fifty lifetime prints from his two most famous series, Marilyn Monroe and California nudes. 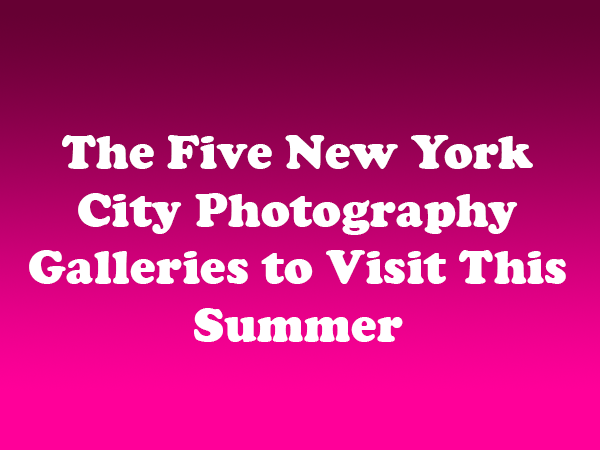 The gallery is located at 515 W 26th St, New York, NY.